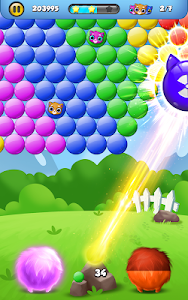 Play the brand-new Cat Bubbles! 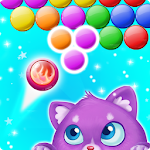 game and save the cute cats who are trapped inside the bubbles! 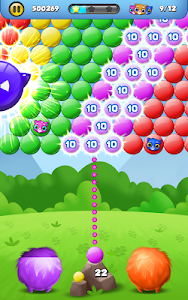 Make combinations of 3 or more the same colored bubbles to pop the combo and win points. Use amazing boosters and super cool power-ups to free the animals from their trap! 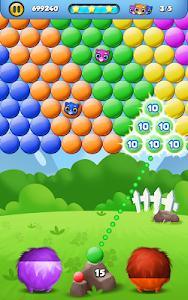 Play hundreds of intriguing levels and solve all the fun puzzles. 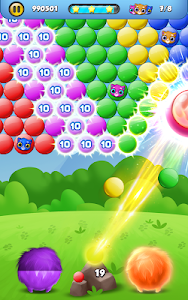 Complete the challenges in each level, and combine boosters to create an extra large explosion that will clear the board. 1. Aim and tap where you want to shoot the bubble. 2. Rescue the cute kittens by popping the bubbles that trap them. 3. Overcome the obstacles by planning ahead. 4. Explore hundreds of challenging levels. 5. Earn exciting boosters that will help you in your mission. 6. Beautiful graphics and effects. 7. Totally free to play and completely addictive! Help rescue the adorable kittens today, and explore hundreds of thrilling levels filled with cool boosts and bonuses. Come along for the adventure, and start popping all the colorful bubbles! Download now and enjoy cool graphics and visual effects, awesome elements, and lots of challenging puzzles. 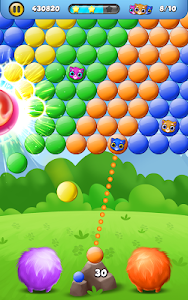 Play this free bubble shooter game and experience the most relaxing pastime.